The push for a public campaign finance system for New York’s politicians heated up as a feud erupted between three young female lawmakers and Gov. Andrew Cuomo’s top aides. Courtney Miller, with Citizen Action, speaks in favor of public campaign financing, at a rally at the state Capitol. They were arguing over a private, $25,000-a-plate fundraiser held by the governor just two weeks before the state budget is due. 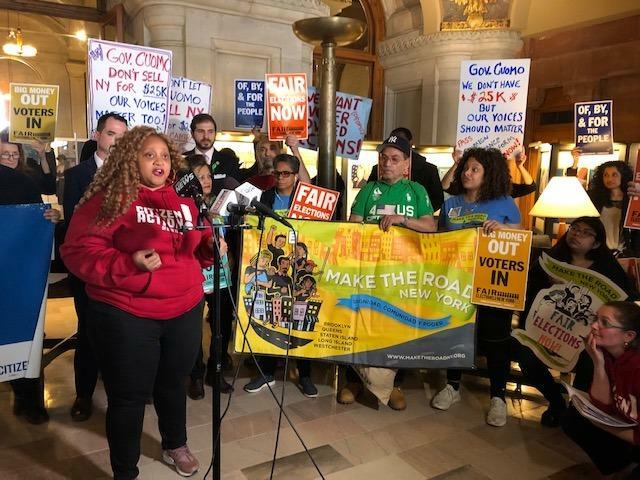 A plan to create a matching small-donor public campaign finance system for statewide elections is included in Cuomo’s budget and has some support in the Democrat-led state Senate. Supporters of the measure, including the government reform group Citizen Action, rallied at the Capitol to urge passage in the state budget. In the meantime, many politicians, including Cuomo, have not stopped holding fundraisers using the current rules, where limits on donations are more generous than other states. That custom came under fire when The New York Times reported on a private, under-the-radar fundraiser held by Cuomo two weeks before the budget was due. The top ticket was $25,000, and many groups with interests at stake in the state budget attended. Cuomo’s budget director also was at the fundraiser. Biaggi, who said she and the others ran for election on a platform that included getting big money out of politics, said the event upset her. Cuomo did not respond personally to the charges, but his aides reacted angrily to reporters and on social media. Cuomo senior adviser Rich Azzopardi said the three lawmakers are the “hypocrites” who should “take a look in the mirror.” He also used a vulgarity about the women when speaking to reporters. And he said the Democratic Senate Campaign committee has scheduled a fundraiser for later in April, where the top ticket is also $25,000. Biaggi and Ramos also held fundraisers earlier this year, with lower-priced tickets. Biaggi’s was in her home district of the Bronx, and the top ticket was $2,500. She said she would not hold a fundraiser at the Capitol during budget season. Ramos’ $250 a person event was in Albany. Ramos, whose fundraiser was also chronicled in The New York Times, said she was selective about the donors she accepted money from. “I rejected somebody’s check and returned it,” said Ramos, who explained the donor was against union organizing. “That is not something I support, I do not need his money,” Ramos said. The three lawmakers said they’ve been told by older legislators that they should not rock the boat over campaign finance reform, and that they may come to appreciate the current system, which allows lawmakers to receive generous contributions from donors. Niou holds the seat once held by former Assembly Speaker Sheldon Silver. He’s facing a prison term after being convicted on corruption charges that partly stemmed from campaign donations. Blair Horner with the New York Public Interest Research Group has chronicled fundraisers held by Albany politicians. He said while there is a difference between a $25,000-a-person fundraiser and one that charges $250, the larger issue is a campaign finance system rife with problems and long overdue for an overhaul. The strongest resistance to adopting public campaign financing comes from the Democrat-led State Assembly, where Speaker Carl Heastie has expressed reservations. Heastie said that since the U.S. Supreme Court’s Citizens United decision, which permits unlimited spending from independent expenditure groups, it’s difficult for a state to regulate campaign spending. On Thursday, Heastie said while public campaign finance is a “worthwhile” goal, he’s concerned about the costs of the program, estimated at $60 million a year. And he said he does not believe he has enough votes among his Democratic members for the measure to pass. Cuomo has said he will not accept a budget without a commitment to a public campaign finance system.